To read a PDF of the Environs brochure, click here. To read a PDF of a 3-page comic, created as part of a agency account pitch for Pizza Pizza , click here. My approach to a writing assignment is initially the same as a graphic design project: I talk with the client in an effort to glean as much information as possible about the relevant subject matter and then conduct any research I feel is necessary to round out my understanding of the client, the product or service, and the task at hand. I keep a pad with me at all times and use it to jot down any observations and thoughts I might have on any of the projects I'm working on. This is especially useful, when talking with a client and they say something that is later useful as a 'pull-quote' to add impact and encourage interest in the body text of the final layout. By the time I put my fingers to the keyboard I want to clearly understand the message, it's objective, and the emotional impact the client wants it to deliver to the reader or listener. The corporate writing and editing/writing revision assignments I've had include brochures, annual reports, promotional brochures and flyers, public relations documents and announcements, ad agency pitch documents, a static-image TV commercial, and radio commercials promoting a fitness center chain and a new housing development. 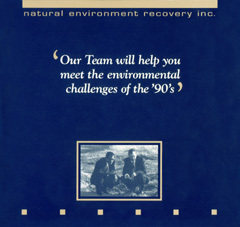 For an overview of the graphic design of this brochure, click here. 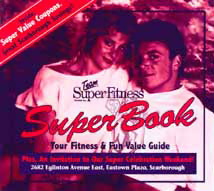 For an overview of the graphic design of this brochure, click here. I've been involved in the development and production of business simulations that incorporate 'live roleplaying' by the participants in an effort to evaluate employee product knowledge and marketing skills. For more information about the creation of Corporate Training Simulations click here. I also have experience writing for the entertainment industry that includes an original comic book series (A Hero Named Harold), roleplay game books (Murphy's World and Bob, Lord of Evil), miniatures rules (GRIT Multigenre Miniatures Rules), roleplay game adventure scenarios, and magazine and webzine articles for the science fiction and gaming industry. I also have written the rules for several unpublished but playtested roleplay, board, and card games. 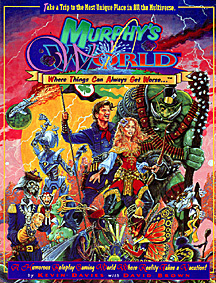 For more information about Murphy's World and game design click here. 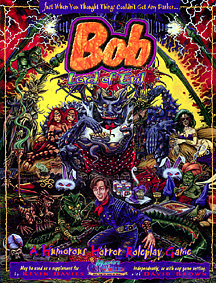 For more information about Bob, Lord of Evil and game writing click here. Content copyright © 1980 to 2004 by Kevin Davies. All rights reserved.